Editors’ note: Design Camp is a sponsor in the featured section of our 2017 Northwest Arkansas Summer Camps & Activities Guide. This story offers additional information about the camps and contact info. Fay Jones School of Architecture and Design Camps, University of Arkansas. Design Camp offers the chance to learn about the design professions through hands-on projects, tours, presentations and discussions led by architecture, landscape architecture and interior design faculty of the Fay Jones School. The camps are in four areas of the state and students will be able to select basic or advanced options. Students will have the opportunity to work closely with faculty and collaborate with peers in a fun and creative studio environment while they walk with you through the design process. Click here to see a sample schedule, showing what the Fayetteville camp could look like. The Fayetteville, Hot Springs and Little Rock camps are open to students going into ninth through 12th grades in fall 2017. The Wilson camp is for students going into third through 12th grades in fall 2017. Each session will meet on location daily, from 8:30 a.m. to 4 p.m. Supplies and lunches will be provided. Cost for the Fayetteville, Little Rock, Hot Springs and Wilson day camps is $300 for early bird registration by April 14, or $350 for regular registration by May 26. Be sure to register for these camps by by May 26th. Who would be a good candidate for Design Camp? 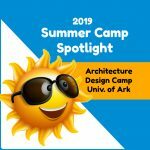 Alison Turner, AIA, LEED AP at the University of Arkansas’ Fay Jones School of Architecture + Design is the director of all of design camps and she also teaches at most of them. 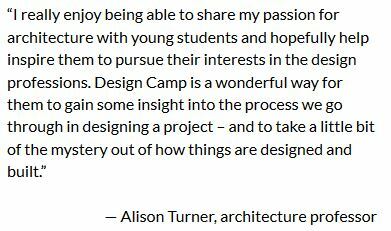 Alison said students who are interested in art, architecture and/or design as a potential career path would really benefit from enrolling in these design camps. 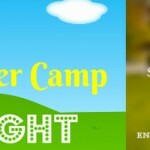 What will campers get to do and learn about? There are three professional programs in the Fay Jones School of Architecture + Design: Architecture, Interior Design and Landscape Architecture. At camp, there will be a focus on teaching students what those professions are and how the design process works. * Room and board for the residential camp in Fayetteville is an additional $300. **Needs-based full and partial scholarships are available. Click here for more info about the Fay Jones School of Architecture and Design Camps. Be sure to register by 5/26!